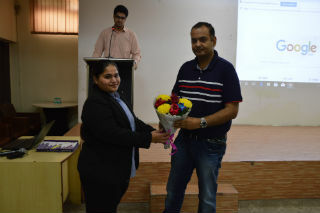 JIMS organized a guest lecture on “Placement Activity” by Mr. Saurabh Mehta on 31st October 2017 who has over Ten Years of experience working in IBM and is currently working with–Cognizant Technology Solutions since 2013. He started with focusing on many aspects of today’s job opportunities and ways to crack them by going in the right direction. 2.Acquiring extraordinary Skills in that area. 4.Performing well in the Selection Process. He also repeated the phrase “PLAN! PREPARE! PERFORM!” to indicate that one should plan the goal well, prepare for it extraordinarily and perform to the best. 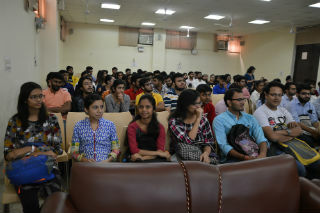 While motivating and educating the students about the importance of good personality, communication and leadership skills, Mr. Mehta proclaimed that, 85% of your Financial Success is due to your personality and ability to communicate, negotiate and lead but shockingly, only 15% is due to technical knowledge. 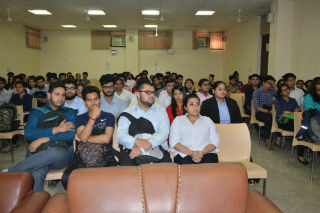 Students actively took part in the workshop by providing appropriate feedback and after the Speech he cleared their doubts about the placement process and ways to land in their dream job. 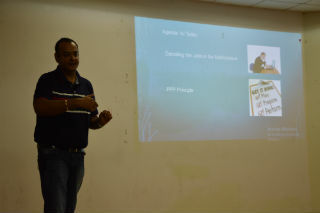 The workshop was successful and fulfilled the objectives of educating the students about the Placement Activities.